The Irvine Ranch Conservancy heavily dedicated their restoration efforts the past year to the historic Irvine Ranch landmarks which consists of 40,000 acres of preserved lands, to create highly functional and resilient ecosystems. These lands contain important natural habitats, sensitive species such as the California Gnatcatcher and Coastal Cactus Wren, and unusual geological formations. It is home to countless plants and animals as well as rocks and fossils, chronicling back nearly 80 million years. However, many natural areas in our modern world must be managed to maintain their ecological function and beauty. In southern California in particular, threats such as increased fire frequency, invasive species, and a large surrounding urban population have all impacted our Natural Landmarks. As a result, portions of the Irvine Ranch Natural Landmarks are considered degraded and in need of restoration. In order to thrive, birds and other wildlife need healthy habitats. There are several different habitats, also known as "vegetation types" or "plant communities" within the Irvine Ranch Natural Landmarks, such as native grassland, scrub or shrubland, oak woodland, and riparian. When selecting a site for restoration, the Irvine Ranch Conservancy (IRC) considers soil type, slope direction, topography, and remnant vegetation. As we highlight specific restoration efforts below, the IRC is looking forward to continuing these restoration efforts in 2019 and beyond. The OCTA-funded project at Bee Flat Canyon will reach its 5-year completion point this year, and IRC anticipates regulatory agency sign-off for this large restoration project as well as lower Agua Chinon. The OCWR-funded Agua Chinon project is also nearing completion, and IRC will enter a less-intensive management phase for that project in 2019. 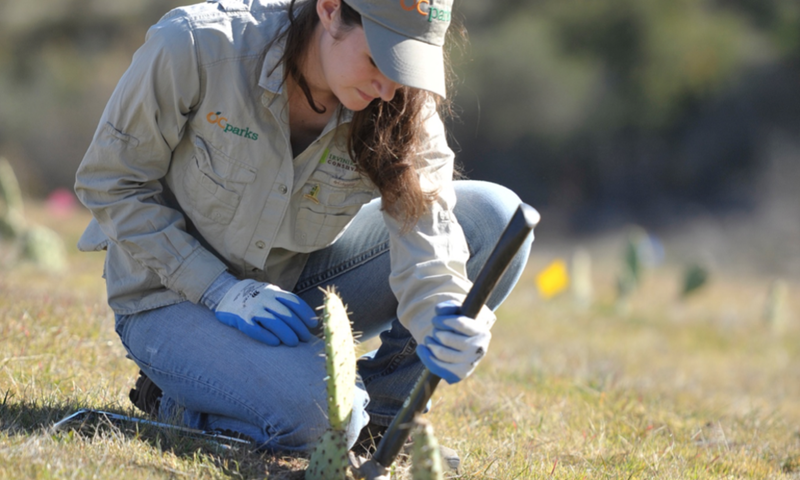 Ecological restoration is an effective way to return native wildlife and plant species to areas degraded by increased fire frequency, invasive species, and other threats. IRC hosts monthly habitat restoration stewardship programming where participants can learn more about ecological restoration and its role in the management of the Irvine Ranch Natural Landmarks. You can get involved! 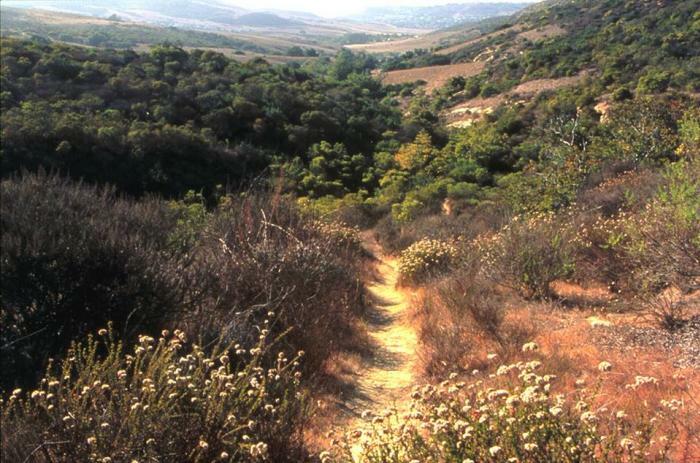 For more details on stewardship programming and activities offered on the Irvine Ranch Natural Landmarks, visit www.LetsGoOutside.org. “IRC staff take a landscape-scale approach to habitat restoration, recognizing the interconnected nature of the various habitats,” said Dr. Nathan Gregory, Director of Science and Stewardship for the Irvine Ranch Conservancy. “The goal is to establish a highly functional, diverse and resilient ecosystem. The combination of successful habitat restoration and long-term maintenance and monitoring should ideally result in improved habitat connectivity, biodiversity, and resilience to disturbance throughout the preserve.” Let’s look back at some specific restoration efforts that occurred throughout 2018. Bommer Canyon in the City of Irvine currently has 14 acres of active habitat restoration, including the 1.5-acre East Fork Restoration Site, which was planted with a variety of shrub species in January 2018. Within these restoration sites, IRC staff focus on irrigation of native plantings and the removal of invasive plants, such as Russian thistle (Salsola tragus), to provide conditions that will allow for the ecological restoration of natural habitat. Work also began on a new 2.4-acre passive restoration site near the East Fork Restoration Site in 2018. Thatch was removed from the vicinity of existing shrubs, which should provide space for new seedling recruitment. In 2013, 1.5 acres of non-native ice plant was removed from a portion of the Buck Gully Reserve and the site was restored to healthy coastal sage scrub habitat. IRC has continued maintaining the site over the past year by removing non-native weeds from within and around the project area. In partnership with OC Parks, IRC is conducting roughly 50 acres of habitat restoration and enhancement activities within the West Loma Ridge area, including an ongoing weed control program. In north-facing habitat restoration sites there has been a focus on removing Russian thistle (Salsola tragus). Conservancy staff also conducted a survey sweep of all active habitat restoration sites for a limited set of targeted invasive plants including artichoke thistle (Cynara cardunculus), fennel (Foeniculum vulgare), and horehound (Marrubium vulgare). Grass and shrub plugs planted in January 2018 are successfully establishing in these areas. Planning and pre-project implementation are currently underway for the new 9.6-acre ridgeline habitat restoration site on the east side of the 241-toll road. This site will be mowed and raked clean in advance of two years of continued site preparation. Weed control will continue in restoration areas west of the 241-toll road. Orange County Transit Authority (OCTA) is funding 84 acres of planned and ongoing habitat restoration within the 293-acre Bee Flat Canyon sub watershed area. Conservancy staff continue ongoing efforts to prevent weeds from setting seed including Russian thistle (Salsola tragus), the cover of which seems to be declining compared to previous years. The other priority this past year was removing excessive accumulations of invasive annual grass thatch that would suppress the growth of native bunchgrasses and prevent the establishment of native wildflowers. Raking thatch has the additional benefit of roughening the soil surface and improving the germination success of wildflower seeds. OCTA is also funding 28.5 acres of habitat restoration within the Silverado Creek watershed. IRC staff focus on the maintenance and enhancement of planted and seeded areas in the Silverado Creek habitat restoration site, as well as 328 acres of targeted invasive control of fountain grass (Pennisetum setaceum), perennial pepperweed (Lepidium latifolium), giant reed (Arundo donax), tamarisk (Tamarix ramosissima), and others. Field crews water planted areas in the habitat restoration sites using drip irrigation and the Conservancy’s specialized watering equipment. In addition to the ongoing habitat restoration work being funded by OC Parks, OCTA is funding 62.5 acres of habitat restoration in the West Loma Ridge area. Similar to other restoration sites, IRC staff has been focused on maintaining the planted and seeded areas within the West Loma Ridge habitat restoration site. This includes targeted invasive plant removal within the larger 400-acre subwatershed, which has recently focused on populations of fennel (Foeniculum vulgare) and artichoke thistle (Cynara cardunculus). Planning and site preparation continue for 18 acres of new sites within the West Loma Ridge habitat restoration area, including mustard thatch removal. An additional 12 acres was seeded just before the first winter rains using a tractor and by hand. Orange County Waste and Recycling (OCWR) is funding 17 acres of habitat restoration work in the Agua Chinon Canyon area. This site is currently in the “maintenance” phase of habitat restoration, focusing on invasive plant control, including Russian thistle (Salsola tragus) and summer mustard (Hirschfeldia incana), and maintaining oak tree seedlings. However, weeds are sparse in this habitat restoration area due to the successful establishment of dense and diverse native cover. IRC staff maintains oak tree seedlings in this area by carefully monitoring and hand watering plants affected by stress, such as extreme heat. Conservancy staff recently removed tree tobacco (Nicotiana glauca) from several highly inaccessible canyons in the headwaters of Agua Chinon Canyon that had not previously been surveyed. The trees were cut down and stump-treated, and flowers or seeds were collected and removed, thus removing a source of seeds that were being dispersed to downstream portions of the wash. Some tamarisk trees (Tamarix sp.) were also removed.